A Slice of Smith Life: Lots of LEGO Link Ups! "There is a spoon on the right, a plate of mashed potatoes in the middle, and in the back of the photo is a cake with white icing, colored sprinkles and a candle in the middle." My son's creation: "This birthday cake reminds me of my first birthday." Also, wouldn't you like to eat out at Christine's daughter's Delicious Diner where it is made out of LEGO with thick, juicy LEGO hamburgers and cheeseburgers? Yum! 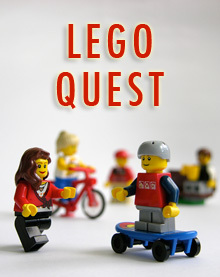 Christine's daughter also joined in on the LEGO Quest Kids challenge. Come join the fun with us! It is really fun for my son and I to see all your LEGO creations. Great post Tracy. I voted for you. WOW very creative indeed! Thanks Tracy for linking up to the Lego Mania party this week. You are always such a great supporter! Aw, thanks for linking up to my post! My daughter will love this when I show her. :) Your kids creations are great. I love that they can really use their imaginations with these challenges...and each child comes up with something different! How creative! I love the bday cake, very cute! Thanks for stopping by. I had no idea there were so many different Lego memes! So glad you and your son enjoyed stopping in to see the LEGO creations :) Thanks for your visit always! Thanks Melissa for hosting the LEGO link up! It's always fun to link back to your great blog to share it with others! You're welcome and it is amazing how each child creates something very different from their imagination! Thanks for stopping by!